Educational background: La Sierra University, Riverside, California: Bachelor of Science in Business Administration 1970; Loma Linda University, Dental School: Doctor of Dental Surgery 1974; Loma Linda University, Masters of Science in Orthodontics 1977. Assistant Professor in Clinical Orthodontics, Loma Linda University-Department of Graduate Orthodontics 1981-82; Diplomate American Board of Orthodontics 1990. Professional affiliations and achievements: Orthodontic Consultant Maui Postgraduate Dental Forum, local chapter of the Seattle Study Club, Member College of Diplomates of the American Board of Orthodontics, Member of American Association of Orthodontists, Member Pacific Coast Society of Orthodontists, Past President, Hawaii Society of Orthodontists, Member American Dental Association, Member Hawaii Dental Association; Past President, Maui County Dental Society; Past President, Rotary club of Maui, Past Rotary Advisor to the Rotaract Club of UH-Maui College. Community Involvement: Dr. Damerell and the Maui Smile Works team have supported The Rotary Club of Maui in food drives for the Maui Food bank, work projects in Haleakala National Park, community work projects such as Hui Malama, motorized and tennis wheel chairs for the disabled, annual collection for Salvation Army, various international projects through the Rotary Foundation like improving water and education, helping orphanages and ridding the world of polio. Personal Tidbits: Dr D was born and raised in Boulder and Westminster, Colorado where he enjoyed skiing, playing the piano and organ, go-karting, bicycling, hiking, camping, 4 wheeling and family. His family moved to Southern California just before his senior year of high school, which he completed at Newbury Park Academy near Thousand Oaks, California. He worked part-time for his Dad at Pomona Irrigation Equipment Company (later ABD Irrig Equip Co) as a truck driver with a Class I, CA driver’s license delivering irrigation pipe all over southern California. For 2 summers in college, he sold Christian Books door to door in San Diego. During his junior year of college, he attended Middle East College, in Beirut, Lebanon and then traveled in the Middle East and Europe during vacations and the following summer. After receiving his B.S. in Business Administration from La Sierra University in 1970, he worked one summer and throughout dental school for the controller at Loma Linda University, reconciling 10 university checking accounts monthly. During dental school he founded a 7-piece Dixie Land Band, which played at various class functions. During dental school, he traveled to Honduras for 2 weeks with a group of dental students, extracting more than 100 teeth/day on needy people in remote villages. He also practiced dentistry for 6 weeks in Monument valley, treating Navajo Native Americans before graduating in March 1974. After graduating, he practiced general dentistry in Needles, CA for 14 months before beginning his orthodontic residency at Loma Linda in June of 1975. During this time, he founded and edited the “Hackergram” newsletter for the class of 1974 to provide a means for his class to stay in touch. During this time he became licensed as a private pilot and then took up hang-gliding in the hills of Southern California during his orthodontic residency. As part of his orthodontic training, he completed his Master’s Thesis, Cephalometric Objectives for the Maxillary Central Incisor. After graduating from his 24-month orthodontic residency in June 1977, he practiced in Blythe, CA for 5 years. He enjoyed water-skiing, canoeing, 4-wheeling, 3-wheeling, travel, flying and writing music. He owned a Mooney 201 and became instrument rated during this time. He also practiced part time in Palm Springs in the offices of Jacob, Craine and Furstman; was assistant Professor in Clinical Orthodontics at Loma Linda University, and joined the Bioprogressive Study Club of Southern California. In 1982, He sold his practice in Blythe and moved to Maui to windsurf and begin a practice there. He received and accepted an opportunity to practice orthodontics at the Clinique Dentaire de la Jeunesse in Geneva, Switzerland for the period from 1983 to 1985, where he learned to read and write French. 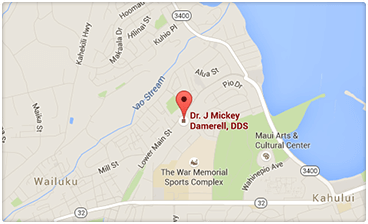 In 1985 he married Laurie Wood in Founex, Switzerland, moved to Maui and started his current orthodontic practice. They had 3 wonderful children: Sean, Beau and Dominique. 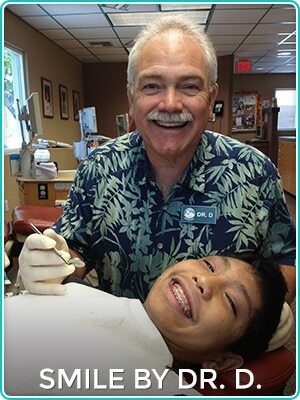 During the past 30 years, he introduced: the Maui Smile Works van to pick up and return students from and to school for appointments; “Braces for $135 per month, no interest, no down”; advertising featuring professional photos of his patients with the slogan: “Give a smile to someone you love!”. He was: Maui’s first certified Invisalign provider, Maui’s first Diplomate of the American Board of Orthodontics, the builder of Hawaii’s first completely digital orthodontic office, Maui’s first orthodontist to become proficient in the use of TADs, SureSmile, Incognito, Harmony and Acceledent. He currently supervises care for his 93 year old Father, living on Maui. He enjoys visiting his children, golf, bicycling, hiking, travel and spending time with friends. He recently traveled to the Philippines for the first time for a dental mission and site seeing with a group of Maui dentists and staff led by Dr. Melanie Vallejos.